Ironhorse PT and Pilates: 5 Strength Exercises you NEED to do if you're a Runner! Running is a series of small jumps from 1 leg to the other and you are never on both feet at the same time. So, why spend the majority of the time training with 2 feet on the ground? There are obvious benefits to doing exercises like squats and deadlifts but there's absolute GOLD in training Single leg and Split Stance exercises for Runners! If you are a beginner to strength training, body weight exercises are a good place to start but don't stop there! That's the mistake most runners make-they don't ever add load or weight to their strength program OR they don't add enough. You have to withstand and absorb forces 3-5x your bodyweight when running. So if you ONLY stick to body weight exercises, your body is more likely to crumple and succumb to gravity under those forces. That makes you vulnerable to injury.....and injury leads to pain and possibly having to stop running.....OH NO! What about that race you signed up and paid for months ago? Let's not that it get to that point, shall we? 1) Single Leg RDL (Romanian Deadlift): Not only do you have to balance on 1 leg but you also have to control your hip and spine rotation. BUT only if you perform this exercise correctly. Adding a kettlebell in the opposite hand adds some resistance challenge to the exercise and helps you to create some tension in your core. This is a picture of this exercise done poorly (LEFT) and then corrected (RIGHT). This was a runner with chronic IT Band problems and knee pain who thought she was doing the right exercies at home on her own but wasn't getting the results she wanted. Until she took our Bulletproof Runner's Strength & Mobility 6 week Series Workshop and we fixed her form! There are also ways to regress/scale or make this exercise easier that we go into depth during the workshop. More on that later. 2) 1/2 kneeling or Split Stance exercises are a great way to challenge hip and core stability independently from your feet and ankles. 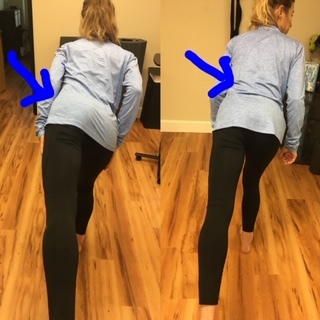 The Single Leg RDL pictured above and in the cover photo is difficult for those who have a hard time balancing on 1 leg (which means your foot/ankle strength and proprioception- your body's joint position sense needs work!). This position in the picture on the LEFT takes the feet almost entirely out of the equation so you can focus on the core and hips. The narrower you place your feet (think of your front heel on a tight rope with your rear thigh), the more challenging this exercise becomes. Simply balancing here and holding a kettlebell or performing a halo or switching the kettlebell between your hands makes it a great core and hip challenge. 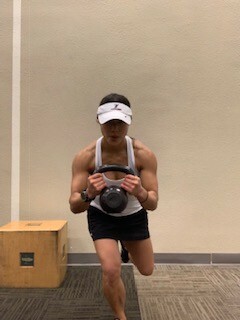 3) The "Airborne Lunge" aka "King Deadlift": The goal is to tap the rear knee down without putting much (or at all) weight onto it and then standing back up while controlling your hip/knee/ankle. Keep the knee tracking between the 2nd/3rd toe and allow the knee to come forward past your ankle as necessary. Your knee will NOT explode! Contrary to what many people think (including those in the fitness industry who are supposed to know better), allowing your knee to come forward isn't necessarily BAD for your knees. It all depends on how you perform the exercise and how much strength and control you bring to the movement. BUT, If this hurts your knee, stop! You're not ready. Maybe you have underlying knee problems ie. patello-femoral symdrome or chondromalacia that makes you sensitive to loading/putting weight on it? Use common sense and consult a Physical Therapist who understands running to help you. Don't workout through pain as there are other ways to get the same benefits without stressing out tissues. What we love about this exercise is that it again makes you work on your feet, hip/core and knee control BUT it has the additional benefit of making you use your ankle range of motion. You need a certain amount of ankle mobility to run well, especially up hills. 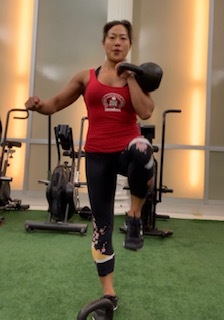 5) Marching with Kettlebells: This can be done in place or with forward movement as well. Think about tall posture and controlled weight shift from side to side. Carrying the load/kettlebell on 1 side makes this a standing side plank exercise. When the kettlebell in on the LEFT side, the RIGHT side of your core (think obliques and glute medius, hip stabilizers, etc.) are all working to keep you from tilting over to the side. We hope you enjoyed reading this article! This is by no means an exhaustive list of exercises we teach runners in our Bulletproof Runner's Strength & Mobility Series Workshop but it's a good start. In the 6 week workshop, we go joint by joint, starting at the feet and ankles and work our way up to the neck and shoulders. Why? Because you run with your whole body, not just your legs. Learn more by giving us a call at 925-222-5446 or sending us an email inquiry at admin@ironhorsept.com. If you want to sign up or purchase this as a gift for a runner you know, you may do so by going HERE.